The Cuisinart CPT-420 leverless 2-slice toaster features Touch to Toast™ function which lowers items into the extra wide slots of toaster. 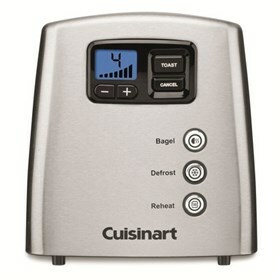 The toaster has easy to use motorized-control, sleek control panel, Blue backlit LCD display with countdown features. 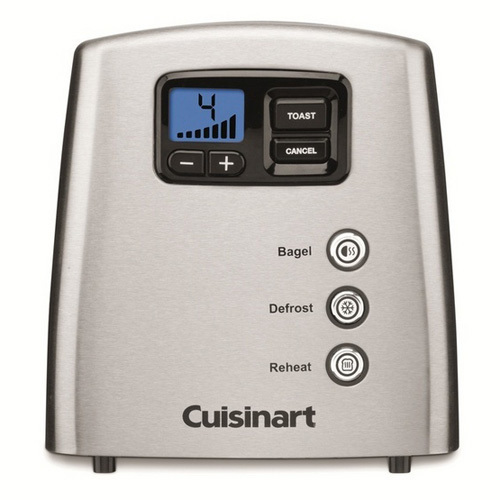 The other important features includes one-sided enhanced bagel toasting, reheat and defrost controls, audible alert signal, 7 shade settings and convenient cord wrap. The Leverless 2-Slice Toaster Countdown has many exciting features for users of all types. You can extend the lifetime of your Leverless 2-Slice Toaster Countdown with the purchase of a FactoryOutletStore Factory Protection Plan. See the Leverless 2-Slice Toaster Countdown gallery images above for more product views. The Leverless 2-Slice Toaster Countdown is sold as a Brand New Unopened Item.